Sometimes when packages turn up at work and the ladies in the Support Office have a nose at what’s arrived it generates confusion and, sometimes, amusement as to why I would order something of that nature. This happened when my Jeffrey Campbell studded heels turned up and they had clearly never seen anything like sky high heels covered in studs and spikes and I think then became slightly dubious about elements of my private life. 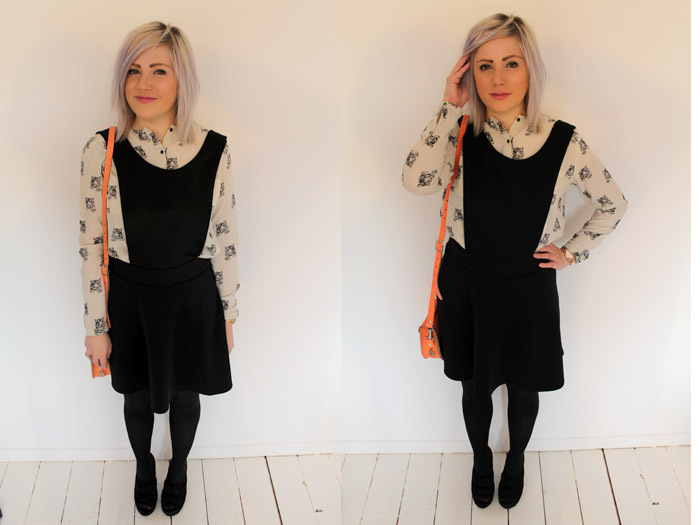 Yesterday when Mr Postman brought a small dress-shaped package and it was brought into the lunch-room, my exclamations of “Ooh, my pinafore has arrived”, were met with some slightly unconvinced looks, with pinafores generally believed to be the attire of young schoolgirls and not 28-year-old office workers. (They were further unconvinced when I revealed that I’d also ordered some dungarees, though not for officewear of course. I think they think I am regressing back to being around 12-years-old). One thing I am convinced about however is my utterly beautiful new Brit Stitch satchel. Brit Stitch are rather causing waves in the blogosphere with their luxury, leather bags and I have falled head over heels for mine. They are truly a thing of beauty and feel much more quality than their sub-£100 price tag – immaculately crafted and available in an array of colours. 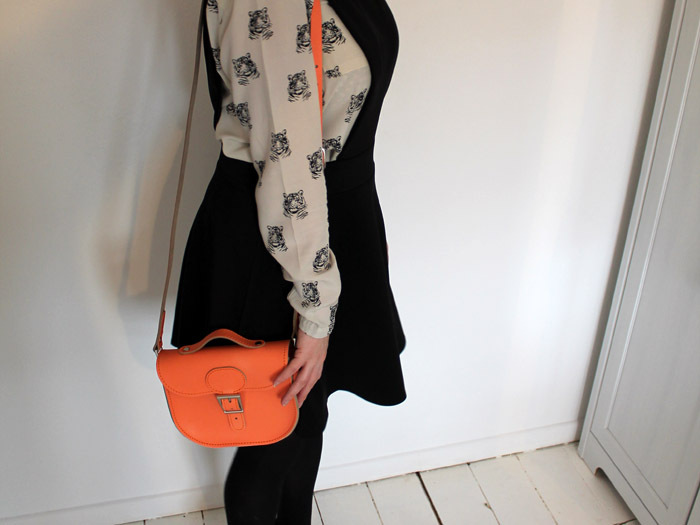 I chose a half-pint shoulder bag in ‘Melon’, which I thought would jazz up monochrome outfits. Brit Stitch’s own website is not quite up and running yet but their bags are available on The Hut and Kuji Shop. 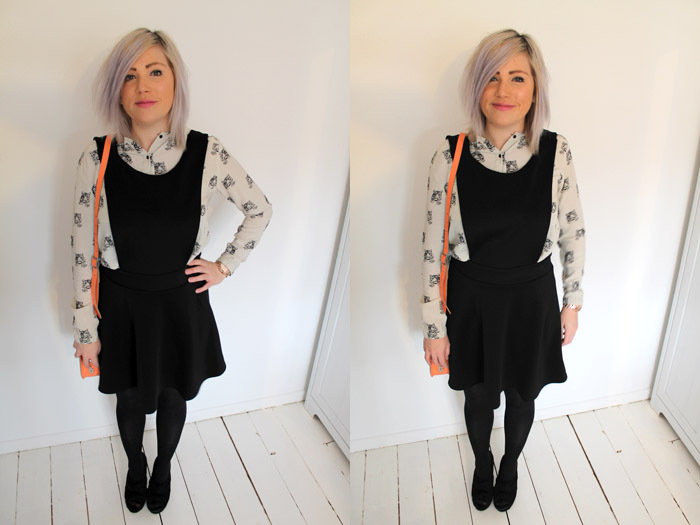 I thought, as I’m clearly now embracing schoolgirl style, that you can’t be a schoolgirl without a smart satchel, and so my Brit Stitch beauty had its first outing. 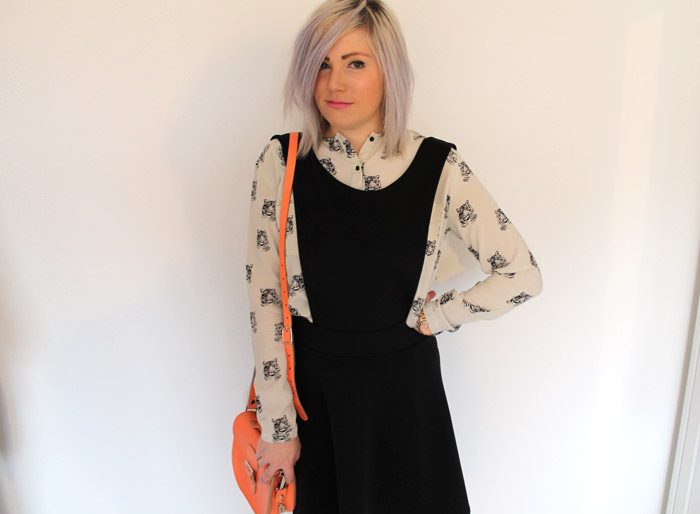 Are you a fan of the pinafore dress? Or do you think that trend’s best left to Ms Chung?